Anyone whose ever picked up an Eminem album knows of his daughter Hailie. Hailie Scott (22) is all grown up now and has graduated from Michigan State University. Hailie stayed away from the spotlight until 2016 when she created an Instagram account that instantly went viral and now has almost a million followers. When asked about her career path she says, "I'm not sure yet, it's kind of up in the air, still" but admits she's open to becoming a famous "influencer." She also says companies have already been contacting her about working together. During the rare interview Hailiee also spoke on her relationship with her father saying "Of course, we are very close." 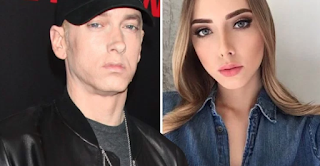 Watch another rare interview of Eminem speaking on love for Hailie.